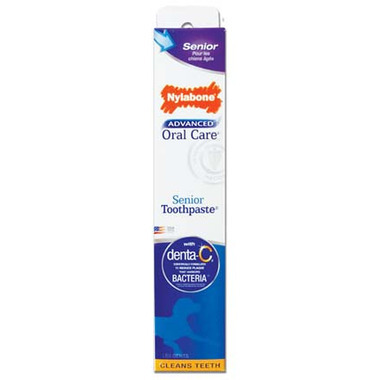 Uniquely formulated for seniors with sensitive teeth and gums; includes calcium and helps to clean teeth, freshen breath and help remove plaque and tartar. Begin by letting your dog taste a small amount of Nylabone Dental Toothpaste. Using your finger, gently rub teeth and gums in a circular motion. Then introduce the toothbrush with a small amount of toothpaste. Allow your dog to taste, then gently start brushing with a back & forth motion (no rinsing is necessary). Ingredients: Dicalcium Phosphate Dihydrate ,Glycerin, Water, Sorbitol, Calcium Carbonate, Sodium Ascorbyl Phosphate, Sodium Copper Chlorophyllin, Sodium Hexametaphosphate, Folic Acid, Chondrus Crispus (Carrageenan) , Glucose, Hydroxyethylcellulose, Sodium Coco-Sulfate, Trisodium EDTA, Potassium Sorbate, Sodium Benzoate, and Flavour. Remember to praise and reward with a treat after every successful brushing! I gave this product a four out of five rating. I think it is helping Cody's breath as well as his teeth. If he were writing this he would probably give it about a one and a half rating. He doesn't seem to enjoy the flavor. My dog seems to like this taste and it gives him fresh breath.